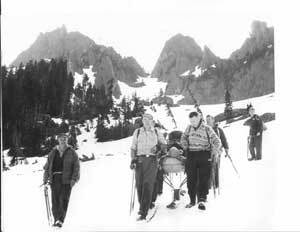 Olympic Mountain Rescue’s history spans over 60 years. Here are some of the people, equipment, places and events that have shaped this valuable organization. Download a PDF of OMR’s First 25 years, written by Keith Spencer, OMR Member since 1957. 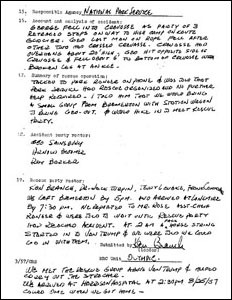 Olympic Mountain Rescue’s (OMR) first official mission report August 24, 1967 for a mission to Mt. Rainier. 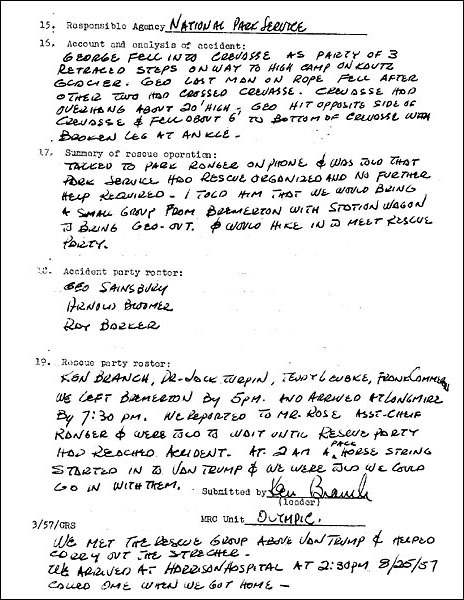 First actual mission report there is after OMR organized with officers. From left to right, we have George Martin, Gordon Sinrud, Floyde Armstead and Jack Newman. 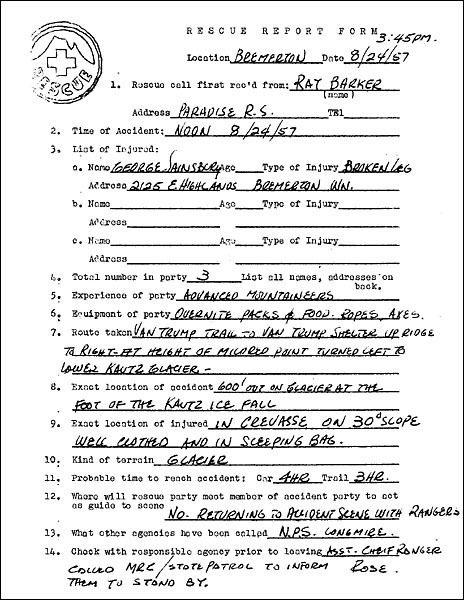 If this was a rescue (not training) it likelywas July 1, 1956 where Roy Harniss fell down a steep chute 300′ resulting in a compound fracture of his right leg (now called Harniss Chute in the Sawtooths). 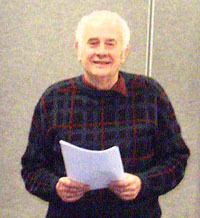 Harniss was 20 at the time and became, 3 years later, the second chairman of OMR. OMR members Bloomer, Kelsey & Sinrud. 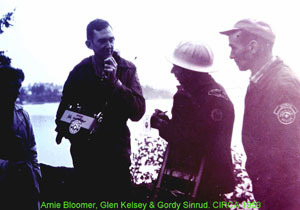 Must have been a new radio very early…probably before 1960. In those days proper radio procedure dictated that a record be made of all transmissions sent or received– hence the handy notebook! 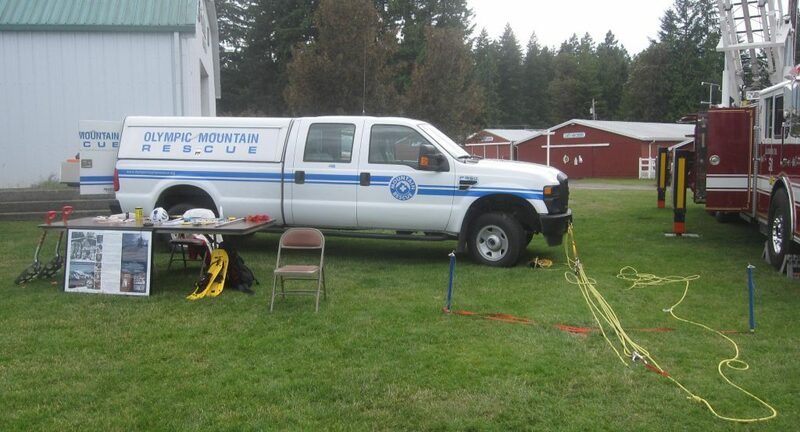 The first official Olympic Mountain Rescue truck was an army Dodge crew cab from Fort Lewis via the Kitsap County EMS office (it always belonged to Kitsap EMS and we just “had it”). We acquired the truck in 1969 or 1970. The truck was in the 1966-1971 Era. A camper shell was purchased and we later painted it a bright yellow. It was a good truck but that year of Dodge was well known for leaky door gaskets and on many trips to St. Helens we would be bundled up in our climbing gear trying to stay warm. In 1973 we acquired a used 1971 Ford crew cab from a leasing company in Yakima. The truck was first looked at when the lease with the Forest Service expired (it was stationed at Shelton or Hoodsport). 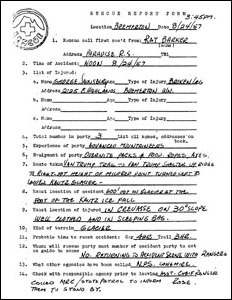 Frank Chapin was the wheeler and dealer to have the box custom built in Seattle. Seattle Mountain Rescue purchased a new 1975 GMC crew cab truck, and Olympic Mountain Rescue (OMR) purchased the truck from them in 1996. The truck was stationed in Shelton and then Quilcene until 2003. Old Blue was retired in 2003. The Photo is taken at Hurricane Ridge during a training mission. 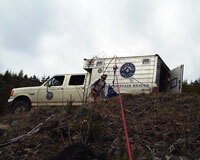 OMR Truck #5 shown here being used as an artificial high directional on a recovery mission. Photo at right shows the current OMR truck, a 2010 Ford F-350 at the annual Kids’ Day Event hosted by Central Kitsap Fire & Rescue at the Kitsap County Fairgrounds. Funds for the purchase of this truck came from a generous donation from the C. Keith Birkenfeld Memorial Trust.